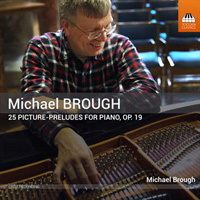 MICHAEL BROUGH (b.1960): 25 Picture-Preludes for Piano, Op. 19. Description: This is a most attractive set of preludes in all the keys, plus a centrally placed one that wanders freely but cannot be sensibly described as atonal, in Romantic style. The pieces each have a specific image or idea associated with them, hence the title of the set; some are explicitly pictorial - the sea, a parade, puppets, a chiming clock - and all have a specific mood. There are barcarolles, Rachmaninovian chordal climaxes, tender lullabies and songs, virtuosic flourishes, a little waltz, a tiny set of variations on what might be a folk tune or hymn, and so on. The piano writing is finely crafted and idiomatic, the character of the pieces diverse and always entertaining, and the cycle is a welcome addition to the many that have followed in Chopin's footsteps. Michael Brough (piano).